Don’t those look delish? Well, they were and they are a snap to whip up and serve, requiring minimal ingredients. 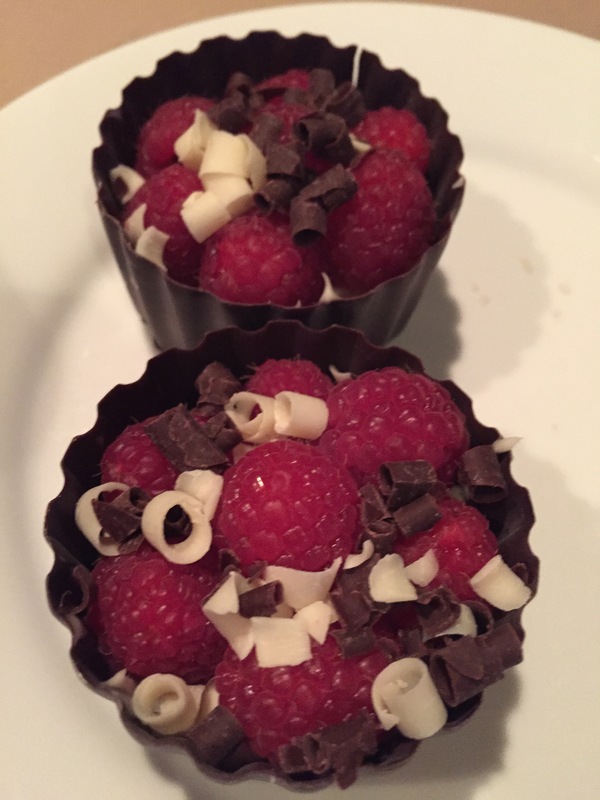 If you are looking for a pretty dessert to serve on the fly, keep the basic ingredients on hand and give this a whirl. Its flexible too, just modify your fruit to what is in season. Or, add some fruit purée to the filling to change up the flavor profile. Then, in a small bowl, I add fresh Marscapone and powdered sugar to sweeten. Yes, it really is that simple. You can whisk it, so it becomes light and fluffy, or you can just stir it in well. This is the point where you can get your ‘creative on’ by adding some fruit purée or substitute an artisan or homemade jam/jelly for the sugar. A citrus oil would be lovely with candied rinds. The combinations abound, just put on that creative thinking cap. 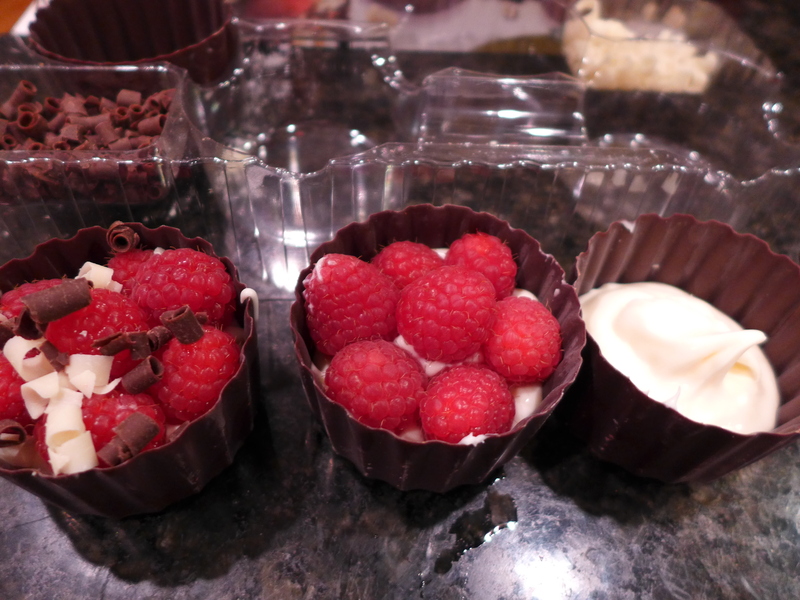 Then, fill your little cups with the cheese mixture, garnish with fruit and top with the curls. SO, SO, SO, easy! Yet impressive too! Some of my happiest memories are of childhood S’mores. Sitting by the campfire on the ocean beach warming myself, barefoot, in a sweatshirt covering my bathing suit; watching the sun disappear over the water framed horizon; toasting a white JetPuff on a driftwood stick, cleaned by the sand and ocean water; watching it brown over the glowing beach-wood coals; laying that warm gooey mess on a bed of milk chocolate; feeling the crunch of the graham cracker in my mouth, the ooze of the melted chocolate, the warmth of that melted pillow of white which squirted and stuck to my fingers, which were then licked clean along with a bit of sand…. Yes, money cannot buy happiness. But it CAN buy marshmallows, and that IS the same thing. My family has been munching on this since I made it earlier this week. It honestly is the most delicious, creamy, stick to your teeth, perfectly balanced toffee I’ve ever had. I seriously love this recipe for the compliments, faces of obvious enjoyment, and groans of gratitude it elicits. 3. 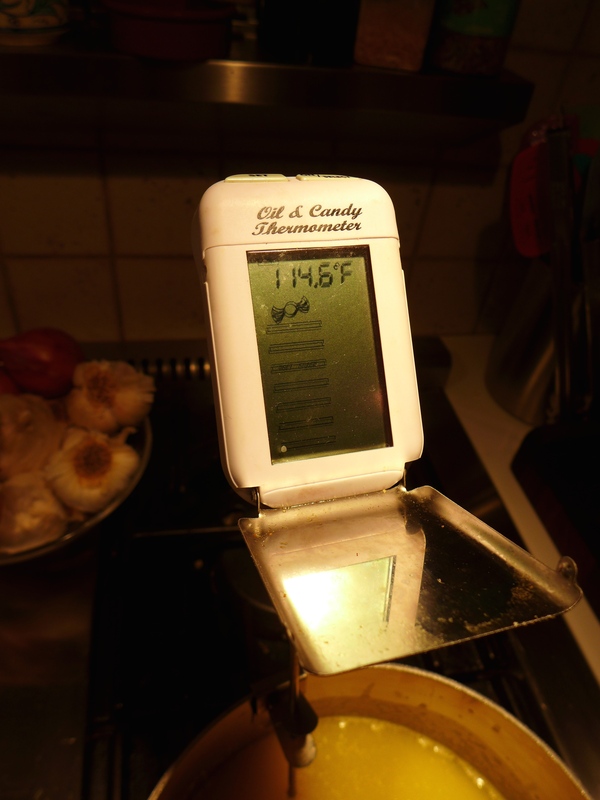 You must have a candy thermometer for this. I know that there are the old fashioned ways to test by dropping a ball in to very cold water and ‘feeling’ it’s stage. In this case, we are looking for hard crack stage. I cook mine to exactly 300 degrees, and I’ve had great success. I consider myself still a novice in the candy making realm, but if you are a candy expert and can eyeball ‘hard crack’, my hat is off to you. 4. The original recipe calls for a chocolate layer, which is melted on the hot toffee as it cools. I skip the chocolate. Honestly? I think chocolate would be distracting to the simple purity of this toffee. Don’t get me wrong, I love chocolate. But there are times it can overshadow the star and, this is one of those times. I’ll let you decide whether or not you want to add chocolate or not. If you do, take chopped chocolate and sprinkle on top of the freshly poured toffee and let sit. The heat of the toffee will melt the chocolate, then you can take an offset spatula and smooth it out. 5. Lastly, you will need a Silpat mat (silicone) or parchment paper. I invested in a Silpat years and years ago and it has been a loyal workhorse in my kitchen. 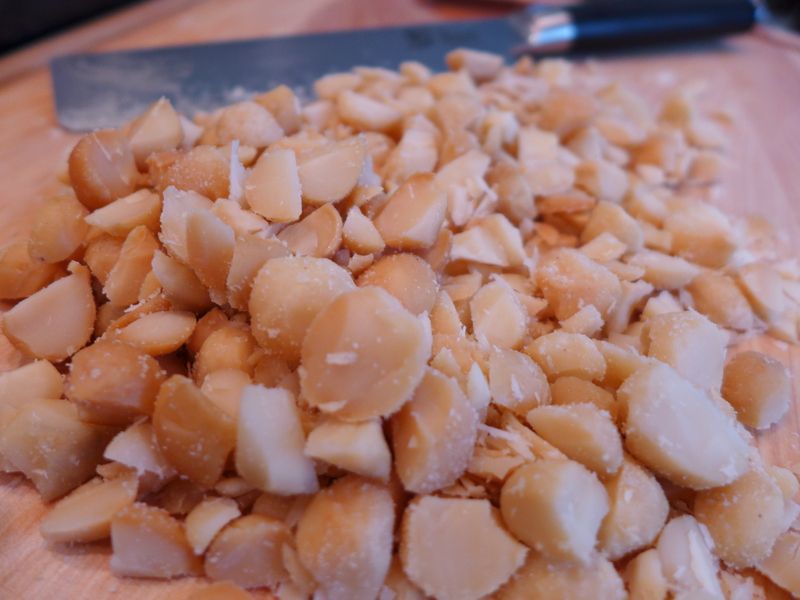 If you don’t have one, its Christmas…..
1 cup chopped macadamia nuts. Line a sheet pan, using the above tip. I use a sheet pan that restaurants use – Jelly Roll pans – they are rimmed. It keeps the toffee contained and reduces the mess! Combine your butter, sugar, corn syrup in a heavy bottomed 4 quart sauce pan. You can use a non-stick pot for easier clean up. Get the butter melting first, then add the other two ingredients. Place over medium to high heat, stir with a wooden spoon and bring the mixture to a boil (*see note below), and reaches 300 degrees (hard crack stage) on a candy thermometer. Pour on to your silpat IMMEDIATELY, and help even it out towards the edges. The nuts can be a bit stubborn and want to clump. Try to do your best to even them out, but don’t sweat it if there are parts with no nuts. It’s still awesomely delish. 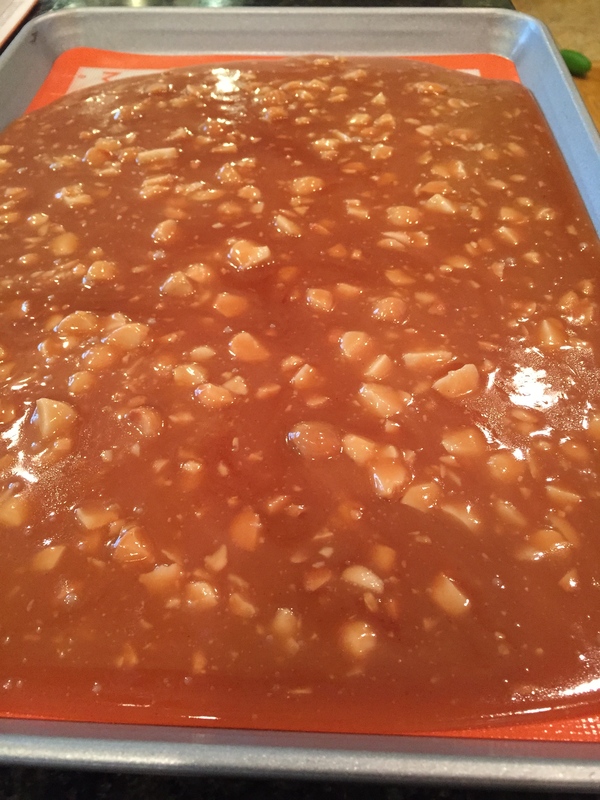 Wait about 5 minutes for toffee to cool slightly. It should be still firm but not sticky. I say that because at this point, excess butter will likely break from the toffee. (**See 2014 update below ) No need to panic, simply blot up the excess with paper towels. Carefully test with your finger around 3 mins to see if it’s set or not. 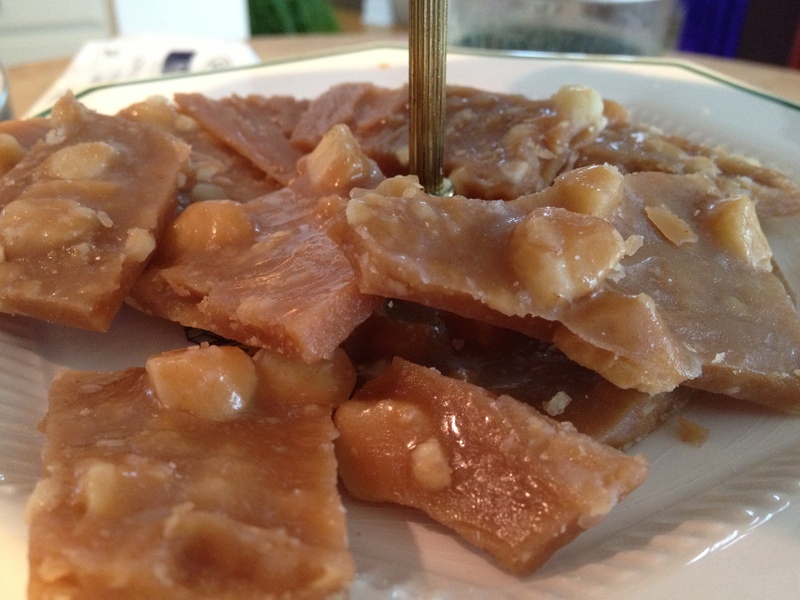 If the toffee is still too hot, blotting will end up with a ruined mess and the consumption of paper. At this point, after blotting, add your chocolate if you wish. Let it cool until its firm, then crack and store in an airtight container. I layer it in between waxed paper in a ziploc bag or plastic food storage container. Stored at room temperature. *I am very careful when stirring to not slosh the sugar/butter mixture up on the sides of the pan. 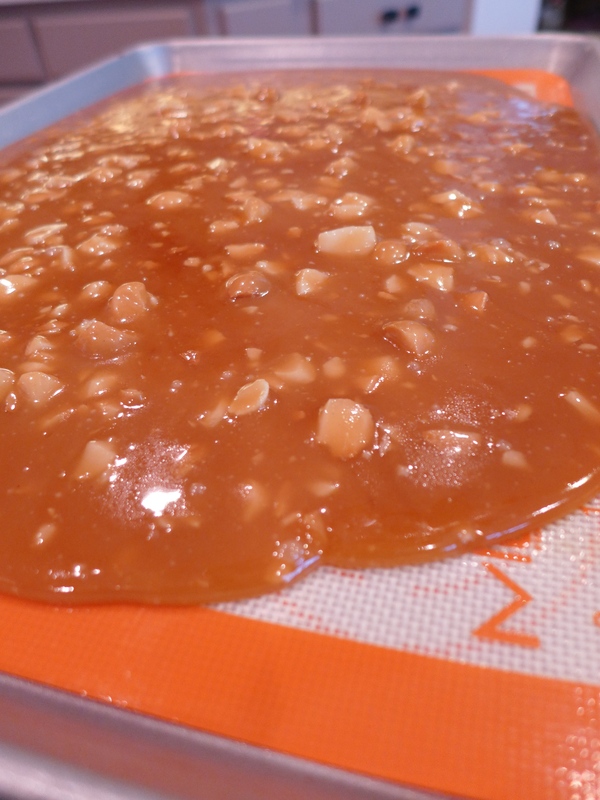 Sugar can be temperamental and you don’t want the toffee to end up sugary in texture, you want it creamy. 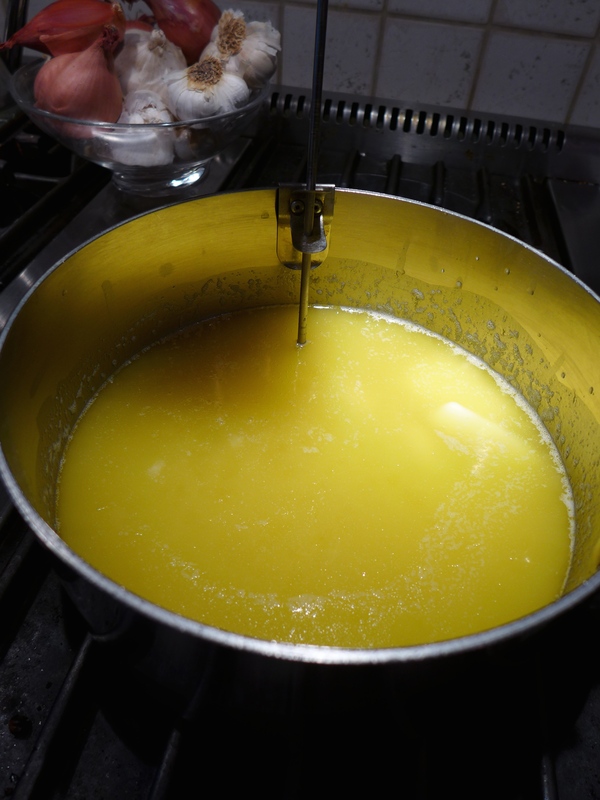 So, to prevent the re-forming of crystals, once the butter is melted I give the mixture a gentle whisk, then I leave it alone. 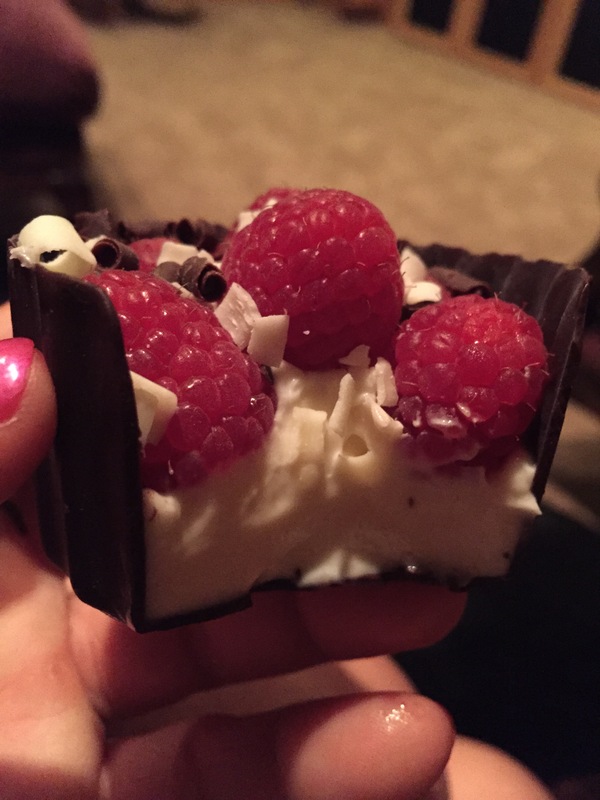 This year I made this with Hope Creamery Unsalted Hi-Fat Butter. The results were amazing! Because the butter was unsalted, I added a hearty ‘pinch’ (about 1/2 tsp) of Himalayan salt while it was cooking. Using the Hi-Fat butter created a more glossy surface and the butter did NOT break out of the toffee, eliminating the whole blotting step. You can use a less expensive butter and this recipe will still yield great results. But if you really want to kick it up a notch, give the High Fat butter a whirl. Note: The photo at the top is with traditional store brand butter. The lower photos (added this year) are with the new Hi-Fat butter. (There are other brands, Plugra is one) As you can see, there is a marked difference in the look. Its less grainy, the color richer and more glossy. That said…trust me. Both will be gone in the blink of an eye!